An Amazing Collection of Modern Baby Nursery Design Inspiration! Lots of Nursery Pictures to Give You All the Nursery Decorating Ideas You Need to Create the Perfect Contemporary Nursery for Your Little One. If you're looking for modern nursery decorating inspiration then you've come to the right place! 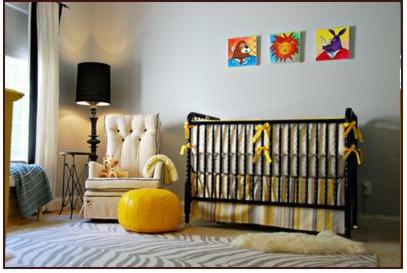 On this page you'll find loads of pictures of contemporary nurseries in lots of different colors and designs. 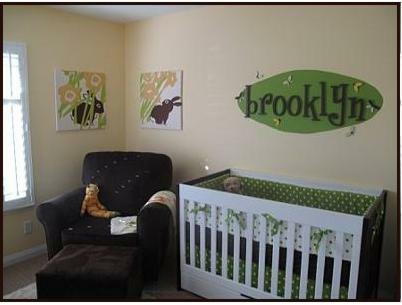 Pick and choose ideas from the different modern nursery designs on this page and put them together to create your own contemporary nursery. Don't forget to come back and enter our baby nursry photos contest when you're finished! This modern baby nursery idea was sent to us by Chris Moseley. You can read more about this dotty modern baby nursery idea here. 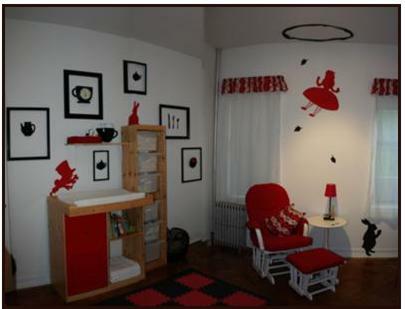 This beautiful contemporary Alice in Wonderland nursery was sent to us by Katy (Brooklyn, NY, USA). You can read more about this Alice in wonderland nursery idea here. This airplane nursery with a modern twist was sent to us by Ashley Franks. You can read more about this modern airplane nursery idea here. 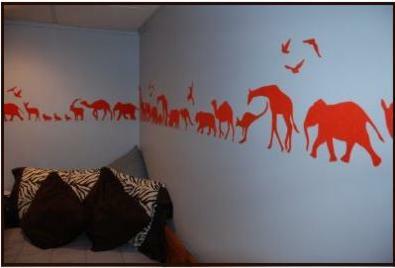 This baby room design was sent to us by Aubrie. You can read more about this modern jungle nursery idea here. 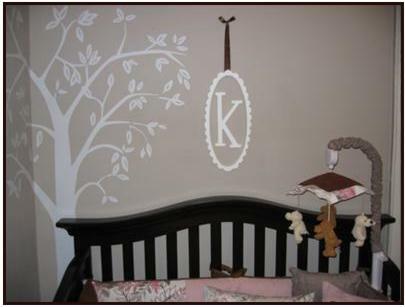 This photo wall nursery idea was sent to us by Heather (Utah, USA). 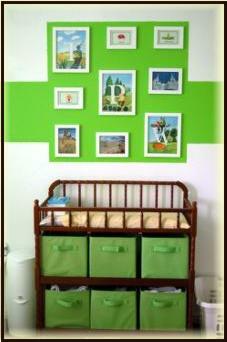 You can read more about this green and white photo wall nursery idea here. 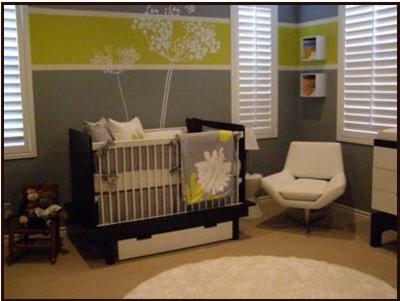 This simple modern baby nursery design was sent to us by Tessa Winn. You can read more about this orange safari nursery idea here. 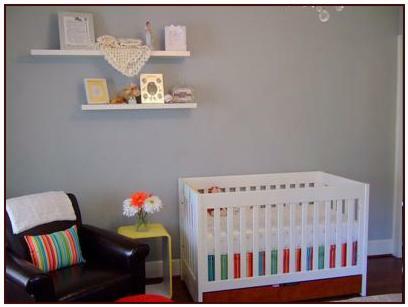 This modern, colorful baby nursery was sent to us by Erica Clements (Orlando, FL). You can read more about this fun and bright nursery here. 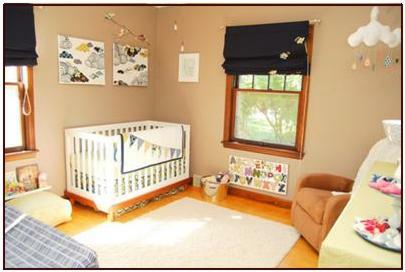 This elegant baby nursery was sent to us by Leah (Milwaukee, WI). 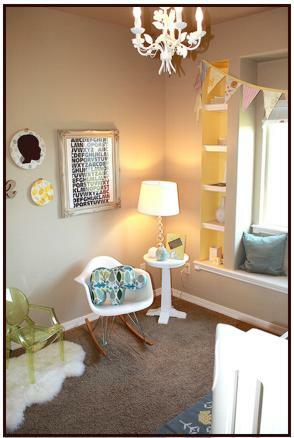 You can read more about this Girly Mod-Sophisticate nursery here. 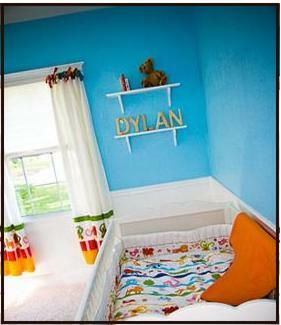 This brightly colored baby nursery was sent to us by Lindsay (USA). 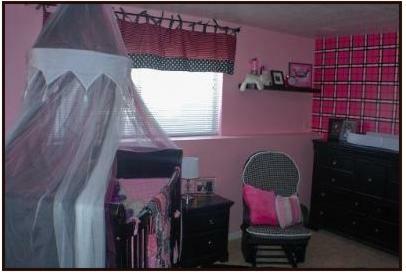 You can read more about this Hot Pink nursery here. 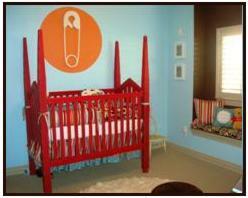 This contemporary nursery was sent to us by Jennifer Moller (Huntington Beach, CA). You can read more about this beautiful modern garden nursery here. 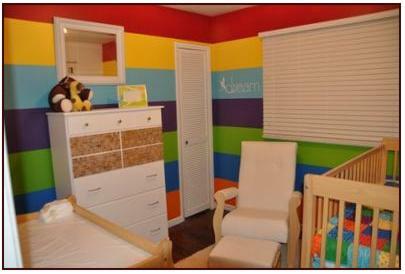 This colorful nursery was sent to us by Staci M. (Frisco, Texas, USA). You can read more about this modern hip baby nursery here. 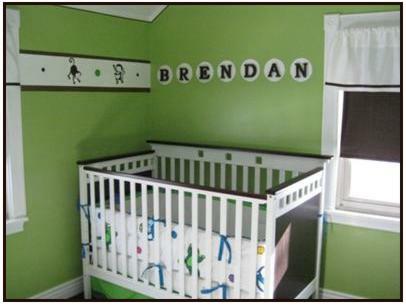 This striking green and brown nursery design was sent to us by Christa B (Buffalo, NY, USA). You can read more about this modern monkey nursery here. 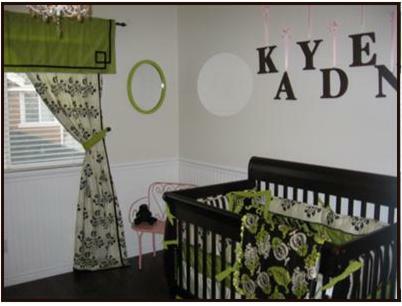 This modern nursery was sent to us by Danielle Griffith (West Valley, UT, USA). You can read more about this pink and black glamor nursery here. 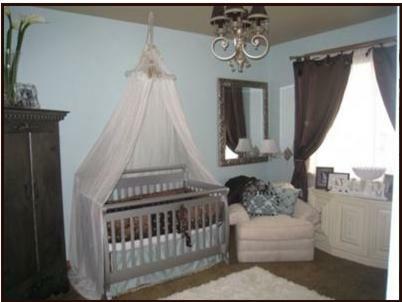 This serene baby room was sent to us by Rani (San Antonio, TX). You can read more about this modern safari nursery here. 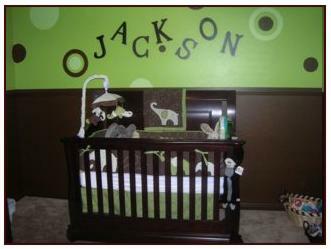 This designer nursery was sent to us by Rachel Akers (Highlands Ranch, CO). You can read more about this couture baby nursery here. 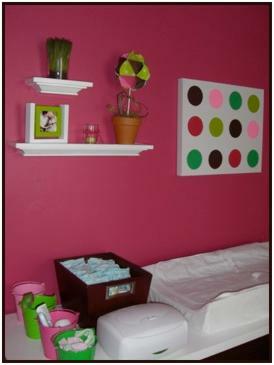 This modern baby nursery for a baby girl was sent to us by Allison McCraner (Tustin, California). You can read more about this modern baby girl nursery here. 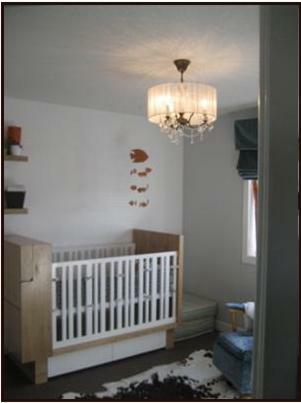 This beautiful baby nursery was sent to us by Rena Snippen (Bend, OR). 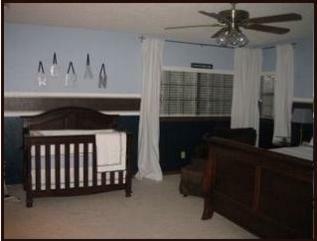 You can read more about this serene blue and brown nursery here. 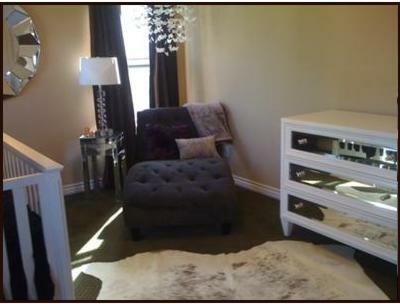 This unusual baby room was sent to us by Leanne (Calgary, Canada). You can read more about this modern retro nursery here. 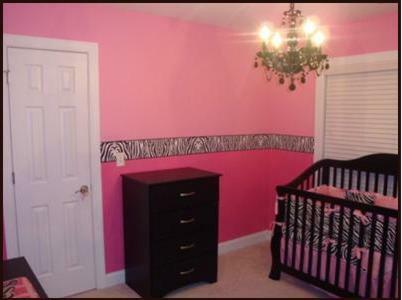 This bright pink baby nursery was sent to us by Amanda (South Carolina). You can read more about this zebra nursery here. 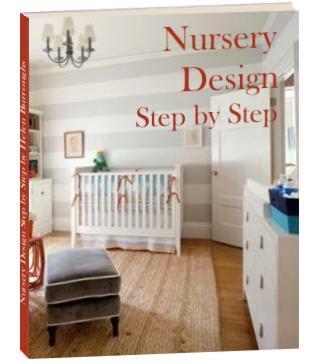 This nursery design was sent to us by Jennifer (San Francisco, CA). You can read more about this modern unisex baby nursery here. 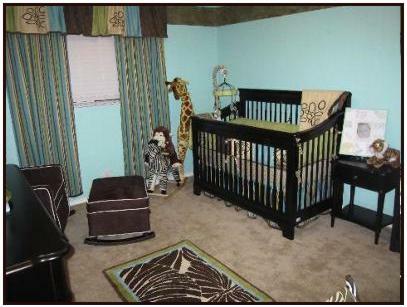 This owl themed baby room was sent to us by Maygan Montz (Baton Rouge, Louisiana). You can read more about this modern owl theme nursery here. 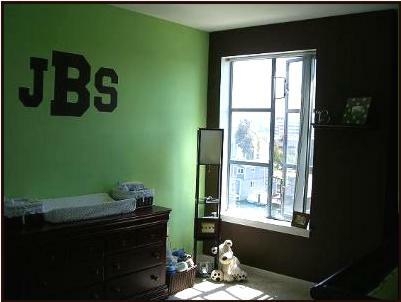 This baby room design was sent to us by Rachel Baker (San Marcos, ca). You can read more about this modern glam nursery here. 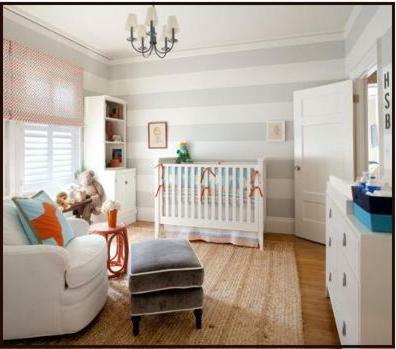 This striped baby nursery was sent to us by Lindsay Brier (USA). 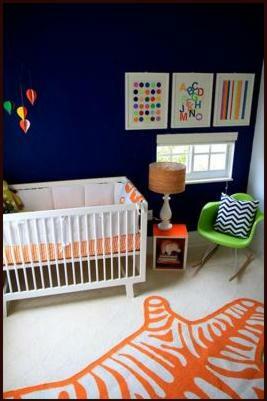 You can read more about this aqua blue and orange nursery here. 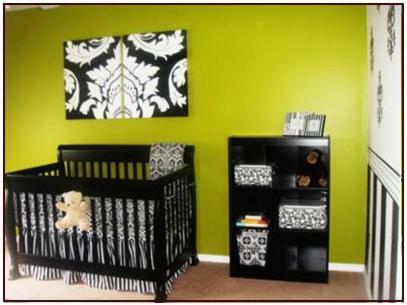 This colorful nursery was sent to us by Gina Houston (Dupo, IL 62239). 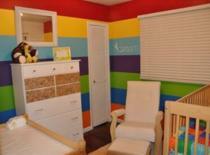 You can read more about this bright and bold baby nursery here. 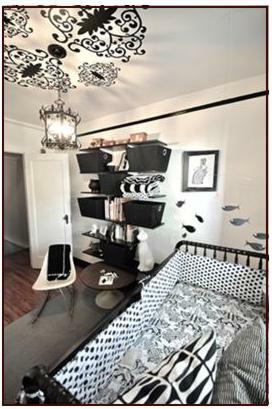 This unusual and striking modern baby room design was sent to us by Samantha Gallacher (Miami Beach, Fl). You can read more about this bold and bright nursery here. 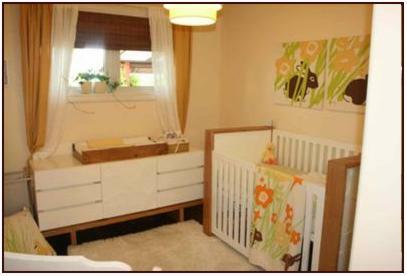 This beautiful fresh nursery was sent to us by Dina (Raleigh, NC USA). You can read more about Knox's Modern Safari nursery here. You can read more about this black and white baby nursery here. You can read more about Mia's modern nursery here. You can read more about this modern color baby nursery here. You can read more about this green and brown elephant baby nursery here. 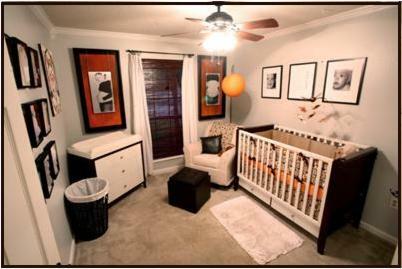 This modern baby room with touches of orange and brown was sent to us by Desiree Pieprzyk (Dallas, TX, USA). You can read more about this happy vibrant baby nursery here. 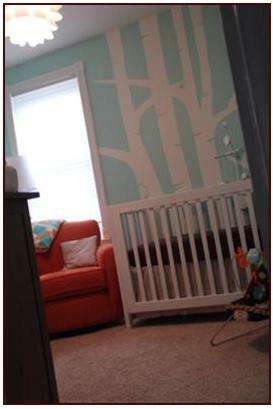 This modern blue and orange baby nursery with trees was sent to us by Becky Voboril (St. Louis). You can read more about this birch tree baby nursery here. 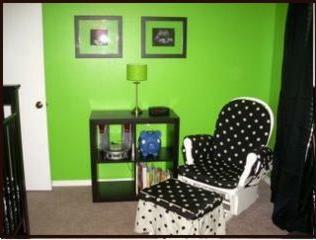 This modern green baby nursery with black and white accents was sent to us by Johanna (St. Louis). You can read more about this sophisticated baby nursery here. 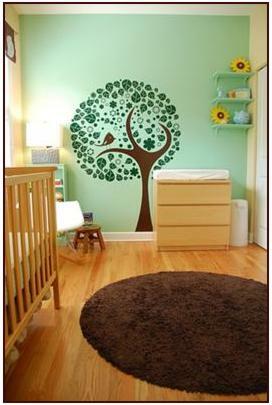 This modern baby nursery with trees and polka dots was sent to us by Djimitri Francois (Chicago, IL). You can read more about this birds and trees baby nursery here. 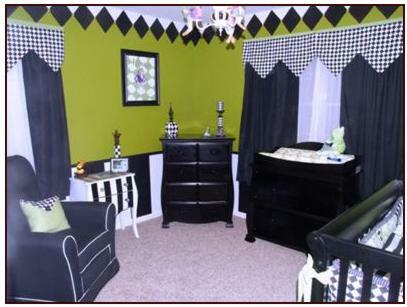 This modern green and black nursery based on the Frog Prince was sent to us by Bobbie Whatley (Iowa Park, Texas). You can read more about this frog prince baby nursery here. This modern meadow nursery for a little girl based on Joel Dewberry's Modern Meadow fabric collection was sent to us by Ali (Illinois). You can read more about this modern baby girl nursery room here. Another modern meadow nursery for a little girl, this one based on Amenity Home's Meadow collection was sent to us by Nicole Wiens (Niagara On the Lake, Ontario, Canada). You can read more about Claire's Tranquil Modern Nursery here. 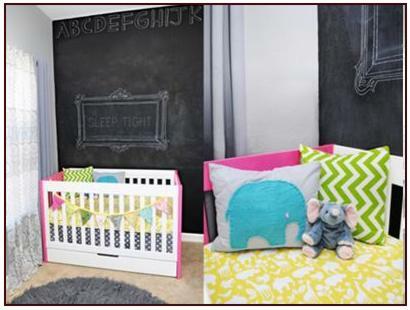 This modern baby nursery with an elephant theme was sent to us by Melanie (Little Elm, Texas). You can read more about this Modern Elephant Nursery here. 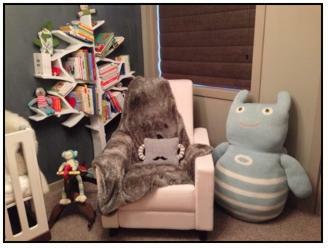 This contemporary baby room with monster mayhem was sent to us by Aaron (Calgary, Alberta, Canada). You can read more about this Modern Monster Nursery here. 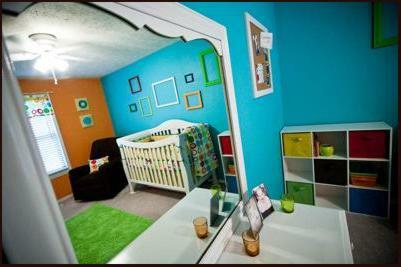 This modern nursery in gorgeous bold colors was sent to us by Patty Burgess (Akron, PA). You can read more about this Contemporary Neutral Giraffe Nursery here. Flickr photo courtesy of Kenziepoo. I hope these modern baby nursery pictures gave you some ideas and inspiration for your own nursery design. If you liked these baby rooms you may like our checks and stripes baby nursery rooms and our polka dots and circles nursery design ideas too! If you want to decorate your baby nursery in the modern style you'll find all the modern baby decor and bedding you need at modernnursery.com and allmodernbaby.com.